What could be common between a children’s animation series, an international call centre, an annual cattle show and online trading in the stock exchange? Surely not the source of money going in? It would take a fairly discursive mind to finance these unrelated enterprises. Or a fairly inventive one. The man funding all these ventures also owns luxury apartments and shopping plazas, provides financial services, has stakes in the oil and gas sector and imports a number of commodities. His name is Aqeel Karim Dhedhi. Karachi knows him well. Too well, in fact. You can scarcely do business in this city without being in competition, or in collaboration, with him. He has his fingers dipped in a little bit of everything, cutting himself a piece of every pie. But his diverse investments are not just a means of hedging financial bets. Many of his projects have not proved financially sustainable yet he remains dedicated to investing in new and untried ventures. “Business is about more than just money. It is about ideas,” is one of the first things he says to me while talking about his venture capital funds set aside for technology start-ups and innovative ideas. Through these start-ups he has carved unchartered territories in the stock market, the telecommunications sector and, of course: animation. Commander Safeguard, to be precise — the eponymous superhero representing a brand of soap, who became a public service icon for children’s hygiene. It was the first animation indigenously produced in Pakistan by a start-up called Post Amazers. The start-up was funded by Dhedhi’s TMT Ventures. Among other things, TMT Ventures gives money to fresh graduates and students with innovative ideas, looking for capital to set up their technology and media businesses. The company works both as a seed fund and a business incubator, providing money and training to aspiring entrepreneurs. Dhedhi has been purposely pioneering these services for the last decade or so. “I’m a strong believer in the first mover advantage,” he explains. He is fairly metaphysical about the bull and bear markets. As one of the richest men in Pakistan, perhaps he can afford to be. In 2000, Dhedhi set up what he claims was Pakistan’s first outbound call centre, mainly dealing in long-distance and international calls. He says he slashed the price of trunk calls to five rupees a minute, at least three times less than what his closest competitor was offering. He was making only 0.10 rupees per call but he succeeded in severely undercutting his competition, attracting bulk traffic. The company that ran the call centre – DV Communications Limited – soon faced a series of legal troubles for allegedly not following regulations put in place by the Pakistan Telecommunication Authority (PTA). By the beginning of 2014, according to the PTA, the company had failed to pay up to 1.6 billion rupees in mandatory licensing fees. That non-payment might have been one reason why DV Communications Limited could keep its call rates so low. Though Dhedhi has since sold the company’s frequency spectrum to pay off this debt, he denies any wrongdoing. “Chorro yaar. They make up rules and regulations as they go along, always to favour the established businesses,” he says, dismissing ten years of legal notices like one swats away a fly. Dhedhi has a flagrant disregard for both the Pakistani business elite and the rules they operate under. He also displays a strong tilt towards trading in cash and liquidity which lands him in frequent, and spirited, battles with regulators. The man is large, well over six feet tall, stout and thick-limbed. Nobody will be walking in the shoes of this giant; they’re simply too big. If ever anyone’s reputation became their visage, Dhedhi is that person. He fills every room he steps into. His stature commanding unbidden respect from colleagues and associates. Most of the companies Dhedhi owns are housed in a single building in Clifton. He has made them largely autonomous – with work spaces and administrative structures of their own – although he monitors them all from his own fifth floor office; in his case that means getting up and physically doing a tour of the compound, a few times a day. For someone so large, Dhedhi is easy to lose track of when he’s up and about. And wherever he goes, people flock around him as if his mass exerts a gravitational pull. His movements are slow but incessant and always forward, like that of a shark. His interactions at these offices, regardless of whether they are over procurements, renovations or investments, have the same air to them. He is always looking for something new to add to his business portfolio. He is not as concerned with performance as he is with futurism. Performance he largely abandons to God. His work day starts around 10 am, at his Defence Housing Authority (DHA) home, where the gates are big and the security detail bigger. He conducts his financial orchestra from his living room on the ground floor. He has a deep, booming voice, much like a qawwal’s. When he wants to talk business, he switches to Memoni, a community based dialect of the Gujarati language. He keeps three phones with him and they never stop ringing. He is often on all three at the same time, effortlessly switching between languages and handsets. Not quite Wall Street — there are no suits, no cocaine, no deals closed at expensive fine dining restaurants. But it is hectic. Doing business in Pakistan means anything can go wrong, anywhere, anytime. There are few rules. Regimes change frequently and what is good for the gander is rarely good for the geese. Dhedhi takes another call, responding in Memoni, about a case against him at the Oil and Gas Regulatory Authority (Ogra). He assures someone on the other side of the phone that all evidence against him is spurious. He later tells me that the Securities and Exchange Commission of Pakistan (SECP) has already rejected all charges of insider trading against him, citing insufficient evidence. The case pertains to allegations that a former Ogra chairman conspired with Sui Southern Gas Company Limited (SSGCL) in 2010 to make windfall profits by temporarily increasing gas tariffs; mainly through shifting the cost of theft and line losses to consumers. Dhedhi was named in the petition because he owns substantial shares in SSGCL. He laughs at the suggestion that he can influence a national regulator like Ogra and make it increase or decrease tariffs. “This is all propaganda,” he says. In a few minutes, he gets another phone call. The person on the other side is asking him if he caught Mubasher Lucman’s television show last night. Dhedhi responds in a tone that suggests the answer should have been obvious. “What is Mubasher doing with his show these days? He has gone soft. He is not making waves anymore. His ratings will fall,” he adds by way of critique, before pausing for the other party to respond. Lucman, a controversial talk-show host who has spent a large part of his career at ARY News, is a good friend of Dhedhi’s. A friendship perhaps made out of necessity. Corporate media is where the new battle lines among businesses are drawn. Public image takes years to build and only a few screen tickers to destroy. When Dhedhi first came under fire by the country’s biggest corporate media house, the Jang Group, over a personal feud, he needed friends, and he needed them fast. ARY News was the antithesis to Jang Group’s Geo News, and Lucman had made his career railing against the latter. So there came a time when Dhedhi found himself a regular on Lucman’s show. When Haji Abdul Karim Dhedhi, a Gujarati Memon, was invited to Karachi in 1946 to invest in the fledgling markets of what was to become Pakistan’s first capital city, he was also asked to invest in Muhammad Ali Jinnah’s media project, an English-language newspaper called Dawn. Dhedhi claims his father was one of the principle sources of the funds collected to launch the newspaper. Around independence, Dhedhi’s family had businesses in Colombo, a textile mill in Chittagong, an export business in his ancestral town of Junagadh and a construction business in Bombay. His father also traded in gold. Since the family’s migration to Karachi, the Dhedhi family businesses have been shrinking geographically. By 1975, his father had wound up his businesses in Colombo and Chittagong. On the other hand, the once subcontinental Dhedhi empire has been reconstructed, on a smaller scale, in the city of Karachi, which now hosts Karim Textiles, Karim Housing and Karim Center in Saddar which was, for a time, the city’s biggest shopping plaza. 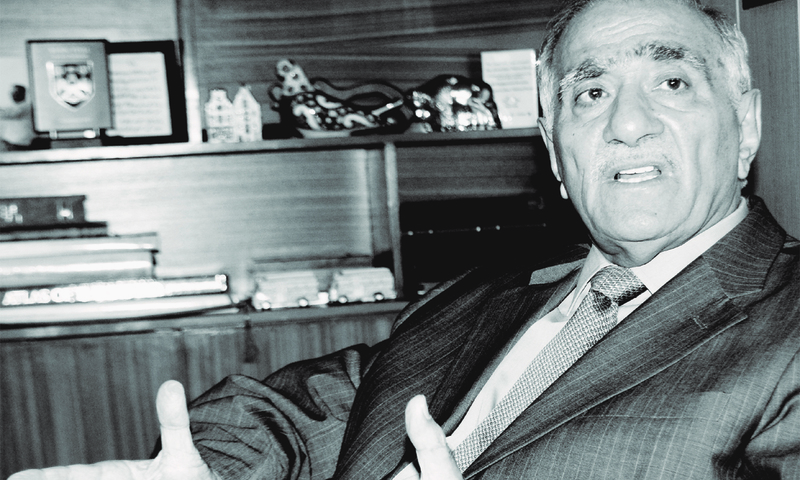 Haji Abdul Karim Dhedhi set up a real estate business and a brokerage house as early as 1947. 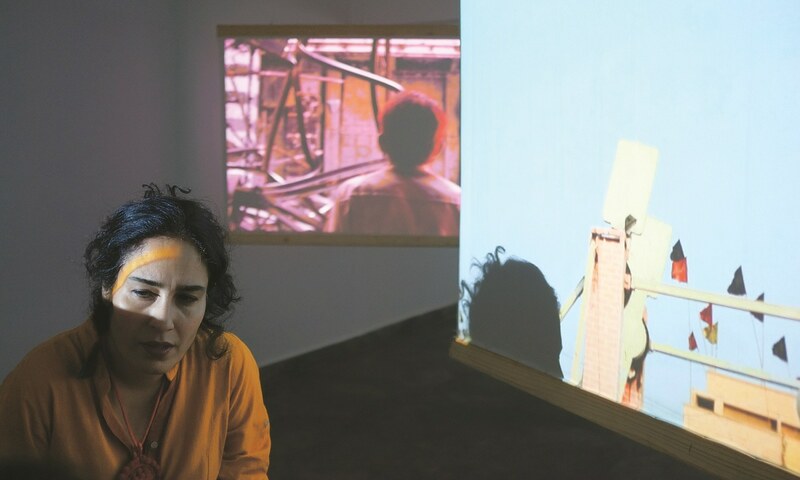 Dhedhi was born ten years later, in 1957. After he cleared his first year intermediate examinations, he quit his studies and joined the family businesses. He says he did not have the patience for books. At the brash age of 16, Dhedhi made some speculative investments in the stock exchange and lost a lot of money. His father had to pay off the debts. “I learned a lot from that failure,” Dhedhi says. The next three years of his life were spent sitting at Karim Center and looking over the commercial properties his father owned. It was only in 1976 that he returned to stock trading. By 1984, he had set up his own company, simultaneously taking over property businesses and other assorted family interests. The rest, as they say, is history. On a sweltering Friday morning, we get into a Range Rover at Dhedhi’s home and drive to DHA Phase VIII where his long-delayed Arkadians residential towers project is still under construction. We arrive at the office of Creek Developers, a conglomerate of companies working on the project. The office has a gorgeous view of the Arabian Sea. There is another reason for the delay which money has so far failed to address. A citizen moved the Sindh High Court against the project, accusing its proprietors of having illegally occupied plots reserved for amenities such as playgrounds, schools and parks. The legal challenge allowed construction work to proceed only haltingly. As the case lingers on, the future of the project remains precariously poised. Dhedhi scoffs at the accusation, claiming DHA gave him the rights to construct these towers in a public auction. 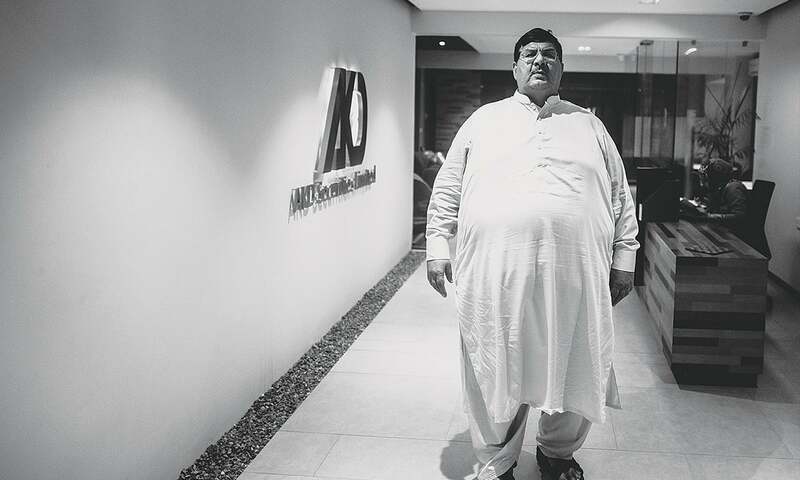 Like the Arkadians project, his Naya Nazimabad housing scheme near Manghopir has gone through years of litigation and stay orders on construction work. 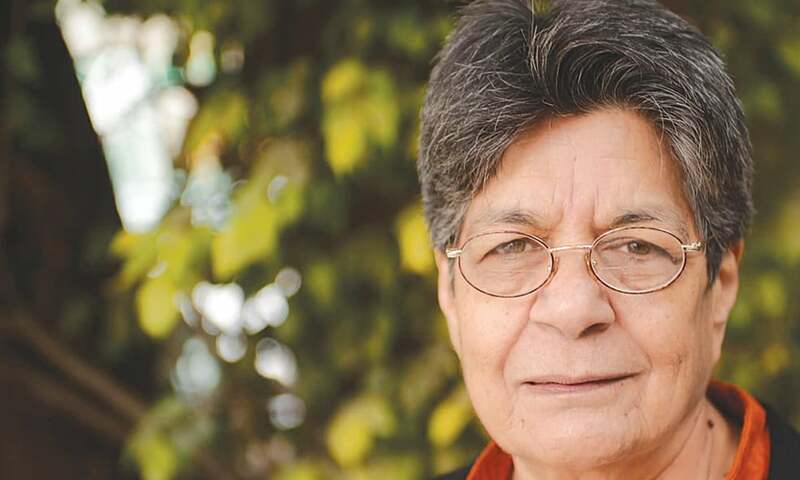 Naya Nazimabad was halted due to petitions in the Sindh High Court by the provincial mines and minerals department, accusing Dhedhi and his building partners of illegally converting mining land into a housing project. Those who purchased land there also went to court and alleged that the scheme was being set up on a toxic dump unsafe for human living. Prime Minister Nawaz Sharif’s principal secretary formed a committee to investigate these allegations. Its report said that the land was indeed reserved for “mining purposes” and that an illegally established chemical factory there had dumped toxic waste over the area where the project was planned. As we walk out of the meeting, a young woman calls out to him and asks if he’s headed home. This is Ayesha Dhedhi, one of his four daughters. She oversees the Arkadians project. Because business and kinship are so closely knit in traditional Memon households, everything has to stay in the family. All of Dhedhi’s daughters oversee some part of his business empire. What might seem regressive in a business sense becomes progressive in a social one. Faith is one thing Dhedhi constantly invokes. Religion is very important to him, in fact to his entire household. There are no wall-hangings or decorations in his home which are not religious in nature. The lavish lawn at his residence does not just serve an aesthetic purpose. Every week or so, he covers it with canopies and holds religious seminars under them. To which he invites some of the most renowned Sunni scholars and preachers in the country. Tariq Jamil, the popular orator from the Tablighi Jamaat, is a regular at the Dhedhi establishment. As is Mufti Muneebur Rehman, who heads the Central Ruet-e-Hilal, the official moon sighting committee in Pakistan. Dhedhi’s father was a devotee of Mufti Mahmud, the father of Jamiat Ulema-e-Islam chief Maulana Fazlur Rehman. The latter has been a guest at Dhedhi’s house many times. Dhedhi considers his interactions with these men of religion as a way to better understand his faith, on personal terms, and also as his contribution to reconciling divergent Sunni traditions. On Fridays, he goes to a mosque for the afternoon congregational prayers. He has to pick from one of the many mosques he has either funded or otherwise been a patron of. Every mosque he enters sees the crowd part to let him move forward. The imams are on good terms with him. Dhedhi is also fond of sacrificial animals. He has no pets around his house, especially no dogs because of religious reasons, but raising slaughter animals is a cultural heirloom he takes pride in. He spends a minor fortune on buying cows and bulls. He says Sibi’s cattle is the most expensive. That Sibi's bulls are the toughest in the world because they are all purebred. That the people of Sibi do not sell their cows, they do not allow interbreeding. The annual maweshi mela (animal show) that takes place around Eidul Azha at his home is testament to this fondness for livestock. Rare breeds, brought in from as far away as Australia, are adorned and put in front of admiring throngs. Dhedhi considers his interactions with these men of religion as a way to better understand his faith, on personal terms, and also as his contribution to reconciling divergent Sunni traditions. He knows that many people consider his animal show ostentation, an uncouth display of wealth, but he believes that sacrificial slaughter has to be done with ceremony. “My father and grandfather taught me this, and my children will do this after me,” he says. Much of what Dhedhi says and does is part of his family tradition. He often quotes his late father, and true to Haji Abdul Karim Dhedhi’s own life, religion and business go hand in hand for Dhedhi. I ask him if he sees any contradiction between his faith and trading in stocks, something many see as a form of gambling. Investing in shares is the most Islamic financial practice possible, he replies. “You invest and get a dividend depending on the stock’s performance. There is no fixed rate of interest.” And he insists that this is not gambling. “We just make educated guesses and hope that God favours our choices.” He is fairly metaphysical about the bull and bear markets. As one of the richest men in Pakistan, perhaps he can afford to be. Dhedhi has the look of someone who is used to having people around, who is used to the noise of floor trading and the commotions of bazaars — used to a cacophony of voices shouting vital information. But he also has the look of someone who has grown weary of public spaces. He admits as much. 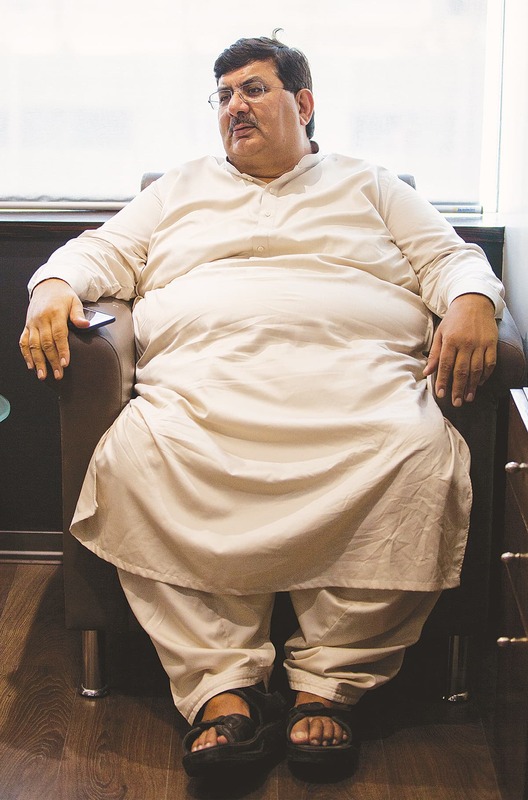 At the heart of this weariness is a decade-long feud with media mogul Mir Shakil-ur-Rehman and business tycoon Jahangir Siddiqui, the latter used to be his business partner once. The fallout between Dhedhi and Siddiqui has happened for many convoluted and ephemeral reasons, but the shadow it has cast over Dhedhi’s business ventures is very tangible. For instance, he says, the plaintiff in the Arkadians case is an Islamabad-based employee of Siddiqui’s bank. “The federal authorities also made a false alcohol possession case against me. A man became an SECP commissioner because of that case, for slinging mud on my name.” Dhedhi keeps churning out names of bureaucrats and ministers who have wronged him. He says Nawaz Sharif’s government has created more problems for him than any other government in four decades. When I first talk about his rivalry with Siddiqui, he absent-mindedly starts scribbling onto a piece of blank paper. Nervous? Irritable? He displays a strong sense of victimhood but also a propensity for selective amnesia. When he says the last SECP chairman was removed because “he was investigating money laundering cases against companies that Siddiqui owns,” Dhedhi does not mention that the man is his former business associate and a good friend. He also does not reveal that his removal as SECP chief happened on the orders of the Supreme Court which termed his appointment illegal. Dhedhi says Mir Shakil-ur-Rehman got involved in the fray because his daughter is married to Siddiqui’s son. The scribbling gets more and more furious as he talks about the feud. Finally, he stops and looks up. “They also filed a case against me saying that I use asbestos for building material and it causes cancer. Dhedhi causes cancer now. I mean, are they crazy?” He puts down the pen, laughing and shaking his head. On a table in Dhedhi’s office, in full view of all visitors, clients and interlocutors, lies the latest Annual Financial Report for Jahangir Siddiqui Bank. This enmity is now the single most defining aspect of Dhedhi’s life. He has piles of documents and folders on what he calls corporate malpractices by Siddiqui, including two reports by the SECP, compiled under his friend’s tenure. Dhedhi claims he has sued both Siddiqui and Mir Shakil-ur-Rehman at the Sindh High Court for defamation. “The court once issued warrants for their arrests but nothing came of it,” he says. Around the same time when these arrest warrants were issued in 2014, another court issued warrants for the arrest of Dhedhi, Lucman and a handful of other media men, from Islamabad, for defaming Mir Shakil-ur-Rehman. This warrant carousel has been going on for a while now. “Do you want evidence against the two? Here is everything they have done wrong. I have the Federal Investigation Agency’s reports on Siddiqui’s companies. I have the SECP reports. Do you want to see? Will you write about these things?” he says, as he piles documents and files in front of me. There is both a challenge and an admonition in his voice. He feels corporate media has been unkind to him. Dhedhi has also compiled a folder carrying all the news stories that the Jang Group publications and television channels have carried against him. If one sifts through business reporting over the last decade, stories that associate Dhedhi’s name with property fraud, black money, insider trading, price fixing and other such crimes have been largely reported in two primary sources: The News and Jang, both owned by Mir Shakil-ur-Rehman. Conversely, Dhedhi himself has lent a lot of his own ‘research’ to ARY News and Lucman who then ran targeted media campaigns against Mir Shakil-ur-Rehman. The pendulum has swung both ways. There is one particular news story that stands out amid this plethora of accusations and counter-accusations. 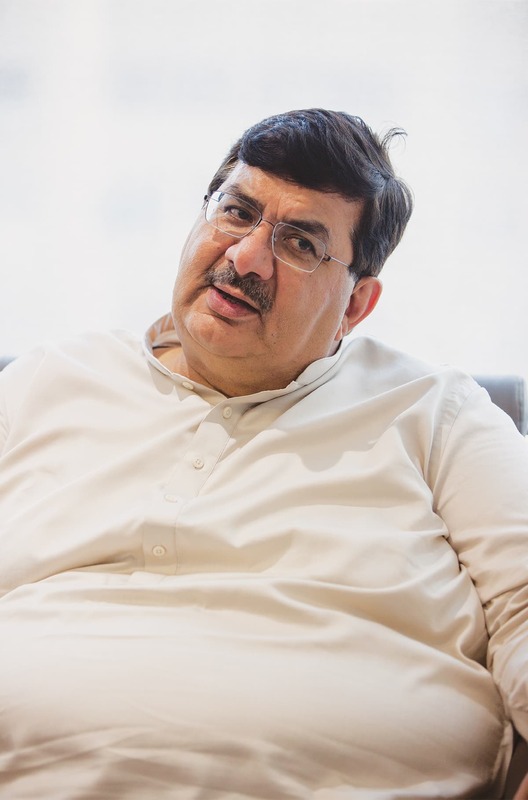 In the fall of 2013, a Karachi-based English daily, Business Recorder, ran a short report about a Reuters piece that had allegedly exposed corruption in the AKD Group’s businesses. The international news agency contacted Business Recorder and said it had not published any such story. The newspaper retracted the report and also issued an apology. Dhedhi alleges the publication of the false report was the handiwork of his rivals. A few months earlier, The Hindustan Times, from across the border, had published a similar story that was similarly retracted after Dhedhi filed a lawsuit. He firmly believes one of his adversaries was in India at the time. While this last statement is difficult to verify, what is clear is that they now spend considerable amounts of their personal time and money in running legal and media campaigns against one another. 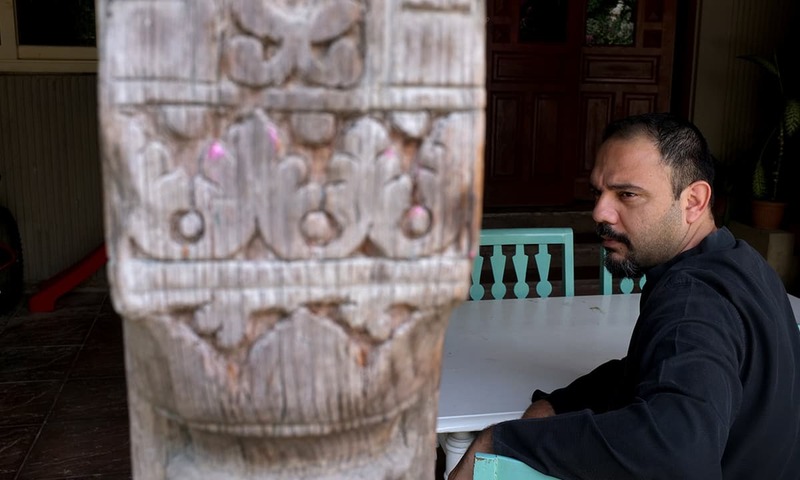 Dhedhi has been entwined with the burgeoning metropolis called Karachi over the course of his entire life. He has grown, and his businesses have grown, like the city itself, in unforeseen and unpredictable ways but always with an underlying purpose: the drive towards new avenues of wealth. Sources of money are less varied in the rest of Pakistan; it is generated through land or established forms of industry. In Karachi, wealth is more dynamic. People like Dhedhi, sitting at the heart of the country’s biggest stock market, have been speculating on other people’s businesses all their lives. The thing with money is that it needs avenues. It needs direction. It needs to go somewhere. There is no point in hoarding it. It is not gold. Dhedhi is very much of the “invest and divest” mindset but government policies, he feels, have often not been helpful. The government only accommodates the traditionalists, he laments. A much younger Dhedhi used to live in Soldier Bazaar near Karachi’s Nishtar Park. This was where Karachi’s elite once lived. Like most of them, he eventually moved to Defence — in 1998, to be exact. The following years were kind to him, as was General (retd) Pervez Musharraf’s military government. Business was brisk and the Karachi Stock Exchange was flourishing. Musharraf gave Dhedhi a national award for services rendered during the 2005 earthquake relief. When Musharraf was issuing licences for private television channels in 2005, a close friend of Dhedhi’s, Nisar Ahmed, wanted to launch a business news channel called Sun TV. He even got the licence for it. But uncertainty was looming round the corner. The transition to democracy after Musharraf’s removal brought multiple problems for Dhedhi. The Karachi Stock Exchange, for one, took a temporary nosedive. More importantly, new regimes came with new rules and new policies, Dhedhi’s businesses in Lahore and Islamabad, his attempted foray into television, into oil and gas, into telecommunications, were all jolted. Sun TV buckled under its own expense-ridden weight before it was even launched. Two years ago, someone tried to kidnap one of his nephews. Since then, Dhedhi has ramped up security around him and his family. His last two animal shows haven’t been as grand as they used to be. Though he still moves around freely in the city, he has become mistrustful of having too many people around him. What was once an entourage is now just a convoy of cellular phones. He has restricted his social interactions largely to his Memon community. He runs schools and a hospital in Kharadar where the Memon community lives in large numbers. He patronises Memon Awaz, a community newspaper, and is the guest of honour at most Memon community events. Even the World Memon Organisation furnished him with accolades. Gujarati and Memon businessmen in Karachi are among the enduring legacies of partition. 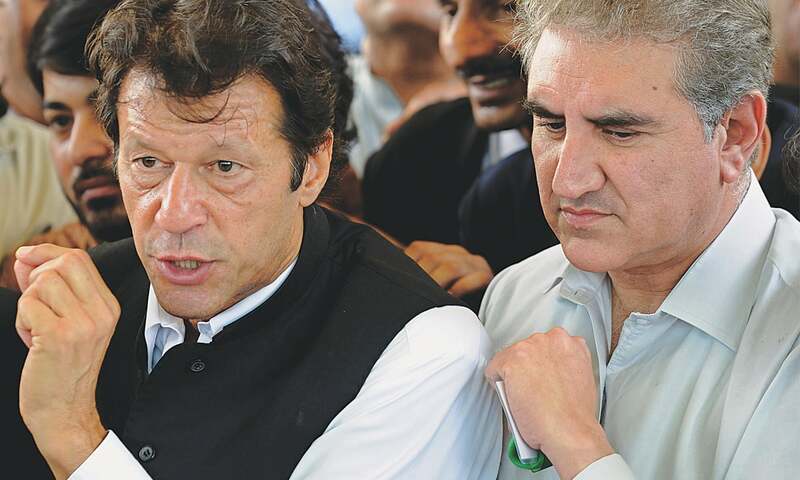 They have contributed immensely to Pakistan’s economic growth but they have also remained somewhat isolated, not fully integrated with the larger province around them, let alone the rest of the country. 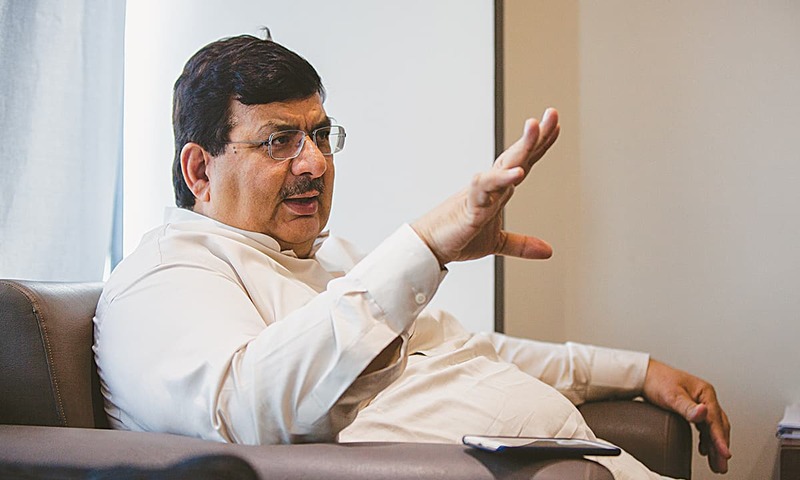 Dhedhi’s own attempts at integration with Pakistan’s economy at large have at best shown lukewarm results, and at worse, landed him in serious legal troubles. I am saddened and disappointed to read the selective and incomplete use of information provided during the interview; the author has painted a biased impression of me. My responses to other business personalities have also been quoted in a mischievous manner. I feel the interviewer has exaggerated only to serve, what I now suspect, was a mala fide intent. This article was originally published in the Herald's November 2015 issue. To read more subscribe to The Herald in print. I get suspicious if he has friends like Tariq Jameel, Musharraf, Lucman and does investment in DHA projects...on those lands that are suppose to provide amenities for poor people of Karachi. I like this person, he is a self made and entrepreneur. He was never in politics as i have seen in this article and never been stakeholder in political party or politics. Appreciate his work subject to his good record of tax payment. Look at business tycoons in the west and look at him - he looks so unhealthy. What is the use of that money and fame? From AKD response, It is clear that the writer, and interviewer has given his own twist to the information provided by AKD, I wonder what was a reason to publish this interview when the person interviewed disagrees with contents of it. AKD has raised number of concerns which can only be alleviated by addressing them according to the law. Nice article. Good to see something other than politics and crimes. Wjth the money he has he could buy his own gym and a personal trainer. Every Western/American/Developed society respects and give prestige to their businessmen/industrialist because they create jobs for million of peoples. I am happy to see that businessmen/Entrepreneur are getting same value and respect in Pakistani society. We need to get rid of "Oye sarmayadara" mentality and respect and learn from these people. Living abroad all my life, good to lean we had good normal business mindsets, then just politics and politicians that we always hear about. The last paragraph is sheer confusion .While reading the article I was considering this as one of those "praising Dedhi ' write ups like Mubasger Luqman does in his so called TV shows. AK Dedhi has been infamous for his notorious and shady business dealings but the author was trying to portray him as an Honest Joe with "great" business acumen. But the footnote says Mr.Dedhi finds this article maligning and against him !!!!! If the author had taken the view of Mr.Siddiqui and the other businessmen rival to Dedhi ,the real truth about Mr.Dedhi would have come out . And to Dawn ,please stop trying to portray sinners as saints, we in Karachi know them all . Great what you are doing, but please look after your health, all that wealth without health is no use! Property, patronage and piety - the magic trifecta that leads to business glory in Pakistan. First of all what an amazing biopic by Dawn in the life of the elitest of the elite of Karachi. No matter whatever people say, I would term Dhedhi as a person who has helped Karachi businesses and eventually helped in creating jobs both knowingly and unknowingly. In an economy which is only suitable to make money for oneself he has helped other flourish. Yes he might have done wrongs but then again we have had (and also currebtly have) wrong people running the country itself. Dawn - please publish my comment as for some reason my comments are always excluded. I hope Mr.Aqeel lives long and be more successful and helpful to the people. But he is trying too hard, and ignoring his health. I also hope he has time to take care of his health too. Good Luck Mr. M. Aqeel Dhedhi. What a farce....after buying soft power through sponsored or bribed talk shows...now he has crept into realms of seemingly unbiased and objective news outlets. This is not an interview, its an advertisement. 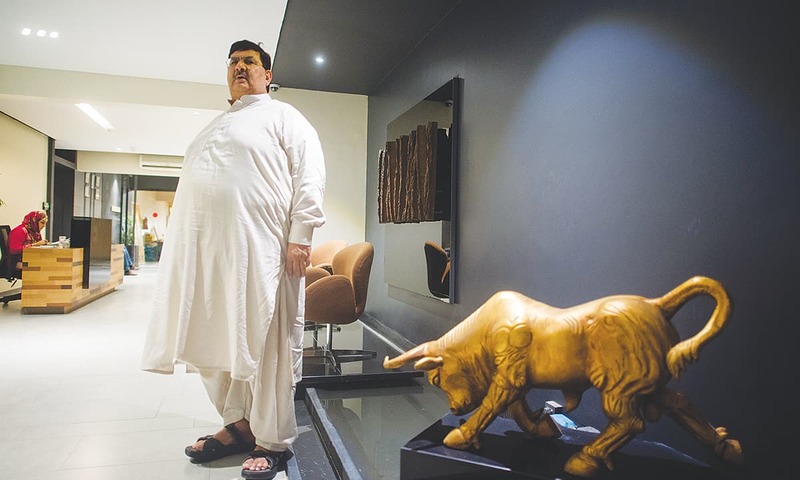 This man is single handedly responsible for price fixing, cartelization, monopolisation of real estate in Karachi.....a toxicity which leads to Domino effect, making hard working tax paying people kicked out of the property cycle. He rigs the Stocks on a daily basis.........I am sure my comments wont be published, so I waste any more ....but it is a shame you are projecting him in this positive spin-light. Pak needs more people like him. The first reason so that this person does not become an oligarch and second Pak need people like him to bring Pak into the 21st century. @Imran Soomro you forgot to mention that There are seven to eight great bookies at KSE who command and manipulate the stock market and rip off billions in a couple of days while poor small investors loose their life's savings . Unfortunately AKD and Jahangir Siddiqui are two of them .Though SECP tried there best but failed due to pressure from above . @asad What an absurd comment. In Western societies, you have strong regulators who make it impossible for businesses to develop on illegal properties or engage in price fixing. I'm not singling out Dhedhi here. Every successful business tycoon in Pakistan is a crook. They regularly engage in bribery of local officials, regulatory capture, and other forms of illegal behavior. For Christ's sake, don't ever compare Pakistan with the West. Interesting article on an interesting personality. Just another reminder that nothing is black and white. There is a lot of gray here, as expected. It is interesting that despite his limited education Dhedhi sees the value of ideas and technology and has vision. Hope his children have been better educated and can grow his little empire. The controversies; well if you want to make omelets you have to break some eggs. Dedhi and his practices are product if the system that he operates in. A system which awards the corrupt and punishes the honest. @Desi Indian A typical Indian that you are, right! You had to look at his looks instead of his successful venture. The guy is obviously loaded. @Desi Indian : Ofcourse we want him to lead a l;ong and healthy life. He gives employment to thousands of his countrymen. He should take care of his health a little more, India and Pakistan need more people like him. Seems to me a good man. Nothing wrong in making money legitimately. @Ghuncha Gul Khan - Actually Overloaded! @Raza That is normal with rich people. Look at Donald Trump he is rich but there is along list of contractors who worked on his projects and never got paid let alone paying taxes. God forbid if he becomes President of United States. This man needs to be investigated about owing taxes and worker's wages, if he is clean then he is a HERO. Wow!! What a great Achievement by a very big businessman. He is a Legend when you do business with him and a legend when you have dinner with him. I assure you this guy didn't get where he is today by standing in the sun. He is a hardworking man. I can't believe he started off being only 15 lbs when he was born and look at him now. I would love to see him compete with others and win big. Dedhi the legend. He should invest some time in gym. Mr. Aqeel is very smart and intelligent person but I am concerned that he is not taking care of his health. He should be on strict diet and exercise to get in shape. If he does not loose weight he will ran into health issues which are not pleasant. Pakistan needs such savvy people who encourage other young people to start businesses and be successful entrepreneurs. I think making money and find new opportunities is in his blood. @Azhar Hussain He is not commenting on his look but on his health. 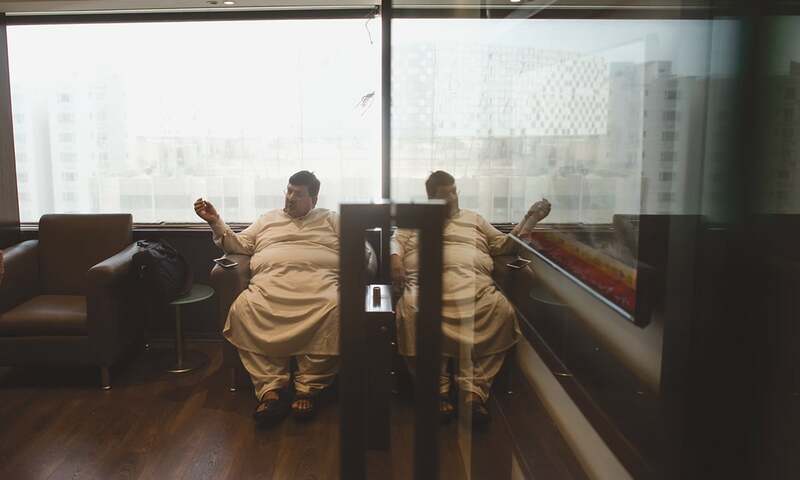 AKD should care about health otherwise there is no point of having this much money. This much weight calls a lot of problems. I think the article is quite neutral and even sympathetic to Mr. Dhedhi. It tries to present both sides of the picture, as it should. Mr. Dhedhi should not be offended that the author presented a balanced view, rather than only a positive view. The author seems to be a balanced journalist, not the mouthpiece of any one party. indeed a good cause...Never respect men merely for their riches, but rather for their philanthropy; we do not value the sun for its height, but for its use. @Raza you're kidding, right? I've worked at AKD for most part of my career and loved it there! employees are highly and timely paid dude! and Aqeel bhai always takes care of his employees! Best company i ever worked in! Amazing personality. A True gentleman. Will help a needy person without letting anyone know about it. I have worked with not in touch with him for a long time but i know this man has done a lot for so many people with any publicity. You cannot get fabulously rich in your life time without using twisted fingers. It is always amazing to read the comments on these pieces. The general populace of the country seems to be totally unaware of the concept of honest unbiased reporting. This has been another incredible piece by the Herald. Once again they have reported the facts, pointed out contradictions where they existed, created a balanced picture and have even published the objection of AKD himself at the bottom. Hopefully if this level of journalism continues more of us will understand how to read a respectable piece of journalism. Keep up the good work! @zulfiqar There is law on paper only, the real law is the will of the corrupt status quo voted in to power by the very people who suffer under its yoke. This fine businessman, should set up a TV show, encouraging youth with various business potential ideas. Pass your knowledge to the youth, so they can transform Pakistan and make it a better place for this man's grandchildren and great gran children.